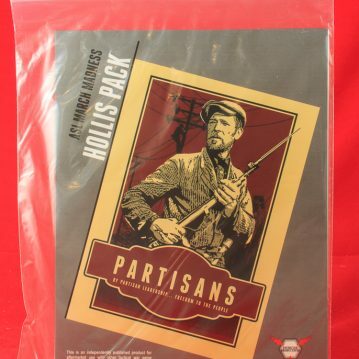 The March Madness Hollis Pack is an unusual pack in that it includes only scenarios featuring leaders named “Hollis.” Nah, we’re just shitting you. But you never would have guessed the real reason, anyway. The March Madness packs are yearly packs released in conjunction with the annual ASL tournament of the Kansas City ASL Club. The releasers formerly described themselves as the Kansas City Irregulars; now they claim to be Encircled Productions, LLC. 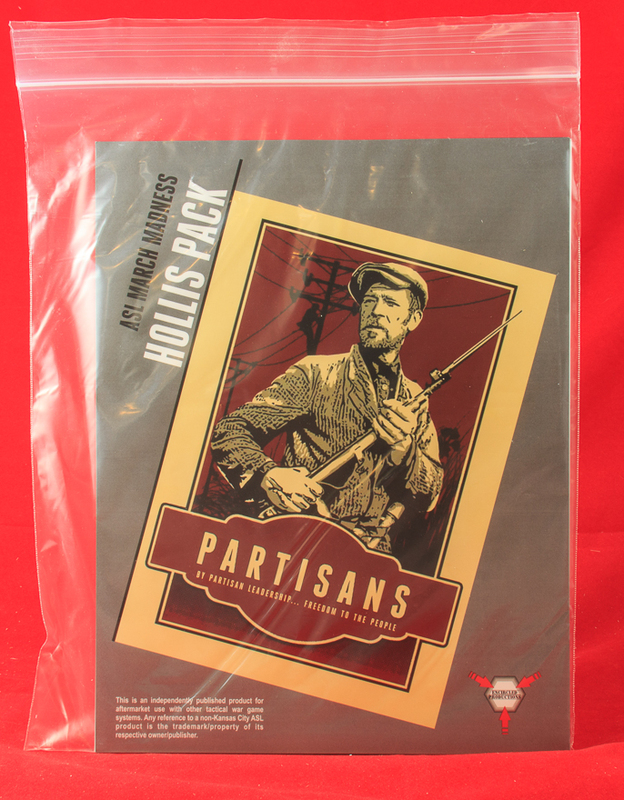 And the Hollis Pack is named after the Hollis Center, a “non-profit Christian retreat center affiliated with the Evangelical Lutheran Church in America open to all seeking a time of retreat and renewal.” And wargaming, apparently, because that is where the KC ASLer’s have been meeting to play for the past several years–thus the name of the pack. This pack may be of most interest to ASLers who like esoteric situations. 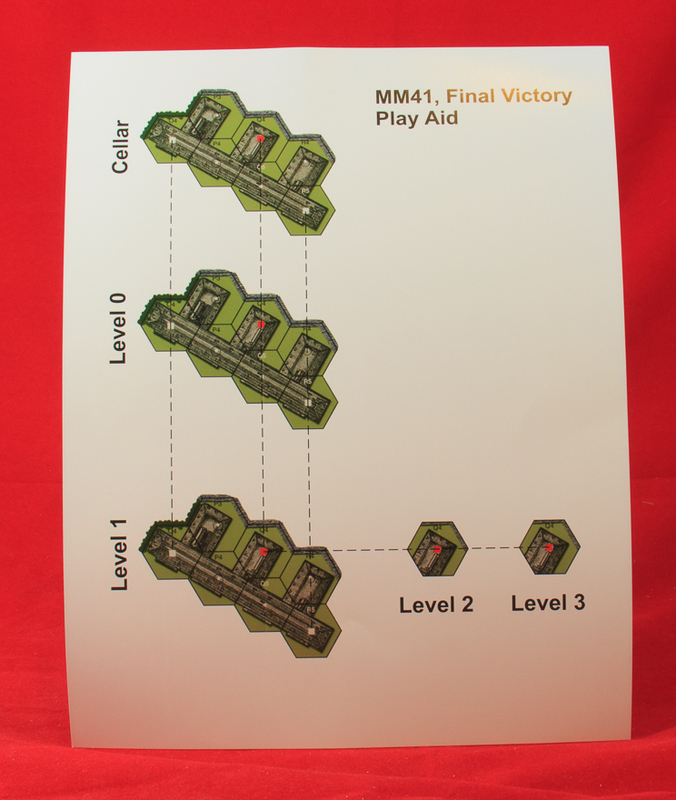 As the publishers themselves say, “there are three great Partisan actions, three Desert scenarios, two commando scenarios and two night games.” Actually, there are nine real scenarios and one “For Fun” scenario (see below). KC scenarios have a tendency to be long and relatively heavy with SSRs. The Hollis pack still has a fair number of SSRs, but there are both large and smaller scenarios in it: 4 small, 1 medium, and 4 large scenarios, to be exact. As noted, two of them use Night rules; one uses OBA. None use Air Support. A variety of foes and places appear in the scenarios: South Africans vs. Italians (Libya, 1941); Soviets vs. Germans (Soviet Union, 1942); Americans vs. Germans (Tunisia, 1943); Americans vs. Italians (Tunisia, 1943); British vs. Italians (Sicily 1943); Polish Partisans vs. Lithuanian collaborators (Poland, 1944); British vs. Germans (France, 1944); Polish Partisans vs. Germans (Poland 1944; 2 scenarios). Boards required to play all of these scenarios include boards 8, 9, 10, 13, 16, 27, 28, 30, 31, 33, 45, 51, 53, 56, 57, 61, and 5a. Desert fans will appreciate the three desert scenarios included, though two of the three are essentially infantry actions. MM33 (Arieta on Totensonntag) is a rarity for desert scenarios: a small, fast playing action. Set in Libya, it features a small Italian combined arms force attacking a South African position (there are no Germans involved, which makes the title a little odd). An all-infantry desert scenario (sorry, tankers), MM35 (10th Panzer Takes the High Ground) is another small action, pitting a well armed German infantry force with two Guns against an American fortified hill position. MM36 (The 9th Sees the Elephant) is the largest desert action. Also set in Tunisia, it depicts an American attack against an Italian fortified position. The Americans get 24 squads (and a couple Guns as reinforcements); the Italians have, in addition to a lot of fortifications, only 12.5 squads (though they will get a few more, an an AFV, as reinforcements) and 2 guns. Each side gets to choose between one of two small reinforcement groups available to them. MM37 (Ninety Night) is one of the two Commando actions (and one of the Night scenarios) and takes place in Sicily. It pits 7 Commando squads and a 76mm MTR against 8 Italian conscript squads and 4 105mm artillery pieces, plus 13 Wire counters. With stealthy Commandos vs. Lax Italian conscripts at night, the Italians better hope that no British get past the wire. The other Commando action is a D-Day action and features 7 Commando squads and three Sherman DD tanks vs. 6 German squads and an AT gun. The British get bicycles, so there’s that. There are also three partisan actions, all featuring the Polish Home Army (Armia Krajowa/AK). 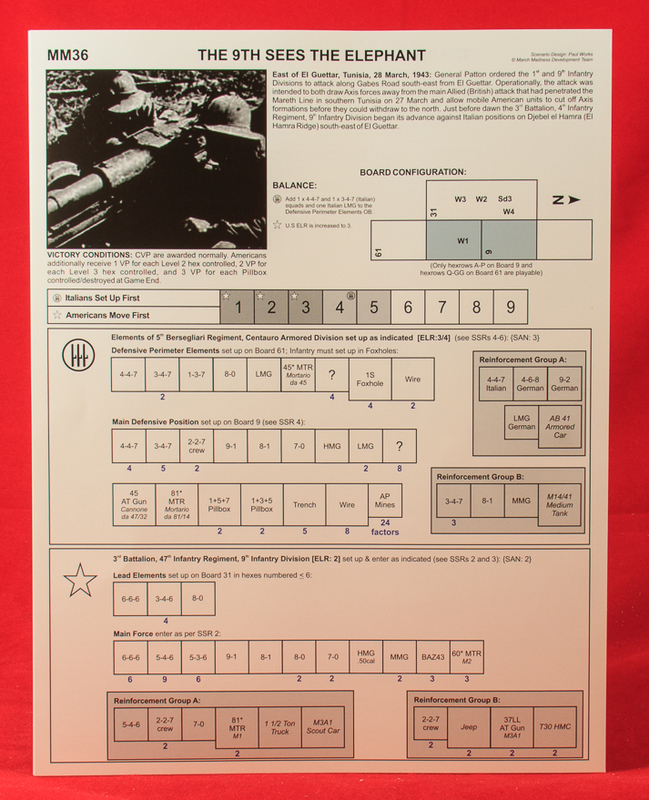 MM38 (Eliminating the LVR) is a large Night scenario featuring 33 partisan squads (divided into three groups, all generically armed with the same items) attacking a fortified force of Lithuanian collaborators, who are represented by Italian counters. The Lithuanians have 23 squads of their own, so it is a pretty substantial scenario. However, the combination of large/partisan/night scenario may mean that it won’t often be played. MM40 (Ochota Revenge) is one of two scenarios set during the 1944 Warsaw Uprising, depicting one of the first German counterattacks against the uprising. MM41 (Final Victory) features the capture by the Poles of one of the few “skyscrapers” in Warsaw, the 11-story PAST telephone building. This author–who is s student of the Warsaw Uprising–considered some years ago designing a scenario on this action, but concluded that it simply would not work well in ASL terms. This attempt uses a large board 45 building, with one hex a 3-level building (i.e., 4 “stories” in ASL terms). 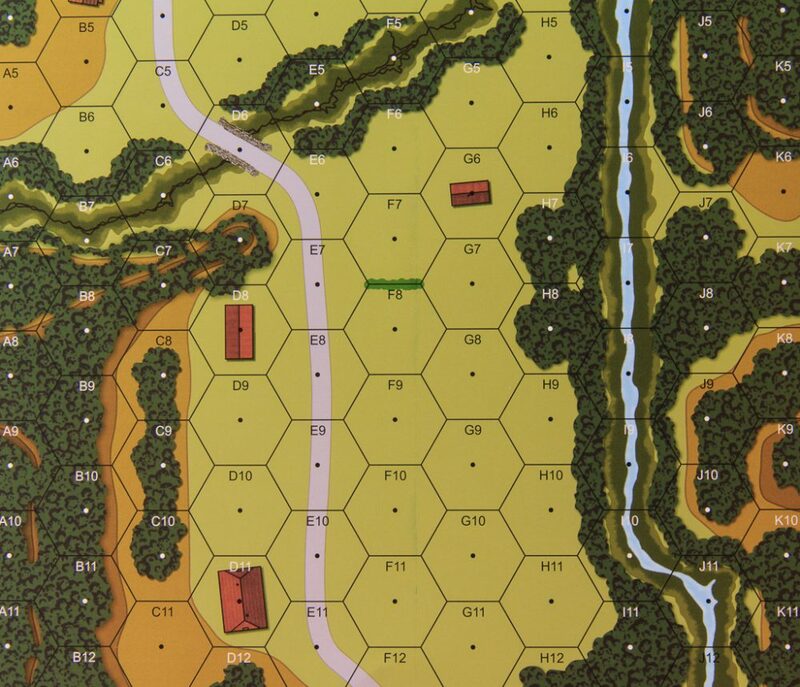 Almost all of the scenario will thus involve taking Locations within one hex in a very small, congested area (which is why the designers provided a play aid of the building). With little maneuver and lots of congestion, this may not be that fun to play (especially considering many German forces are likely to spend much of the scenario encircled). 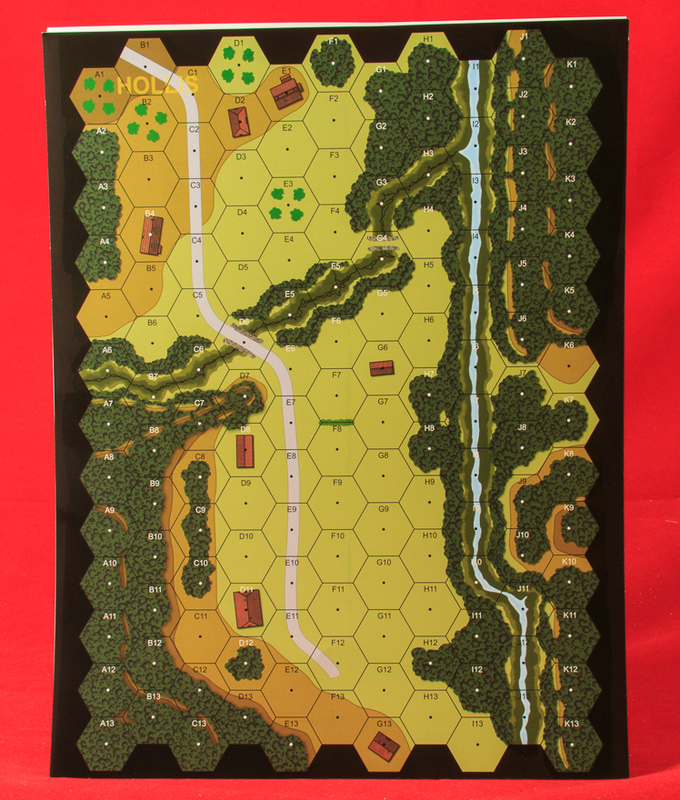 The ninth scenario, MM34 (Yevpatoriya Mop Up) is the only “non-special” scenario in the pack; it is a fairly straightforward East Front action depicting a large German assault on some Soviet fortified buildings. That leaves the “For Fun” scenario, which is probably fun mostly for KC ASLers rather than the general ASL public, as it is a scenario actually set in the present day at the Hollis Center (using an included 8.5″ x 11″ map of the vicinity), depicting 5 German SS squads coming to root out a bunch of ASLers (represented by partisans) “and force them back to their families.” The little map is nicely done, as far as that goes, but it won’t resonate with anyone who hasn’t been there.